Domaine de Grand Pré makes polished and elegant Nova Scotian wines. The Domaine is known for its crisp and clean flavour profile and they pride themselves in using only 100 per cent Nova Scotian grown grapes. They grow specialty grapes that were developed for the Nova Scotian climate and landscape and the resulting wines wine awards year after year. 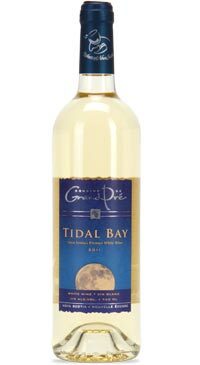 Nova Scotia’s Premiere White Wine. A wine with unique character, Tidal Bay brilliantly reflects its birthplace: the terroir, coastal breezes, cooler climate and our winemakers world-class craftsmanship. It has a distinctive brightness in the glass. The nose is fresh, with light citrus and stone fruit character. The palate is crisp with a hint of balancing residual sweetness. This is a blend of 30% L’Acadie Blanc, 20% Ortega, 20% Seyval, 20% Vidal and 10% Muscat.